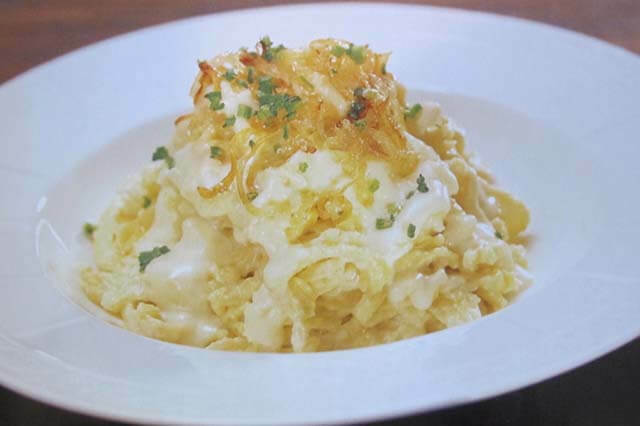 The most popular recipe has to be Käsespätzle or Cheese Spatzle. The equivelant of the American Macaroni Cheese. While traditionally, it is only made with cheese and sauteed onions, modern style is with a cheese sauce. Here the recipe is the way my Mother made it. Saute the finely sliced onion until golden brown. Add the spaetzle and saute. Layer in the pan the spaetzle, cheeses and parsley. Put the lid on the pan and turn the heat off for 5 mins. The intention is that the cheese melts but doesn’t gum up the frying pan with stirring. Serve with a crisp Garden salad as you would an omelette. Rinse the Spaetzle Maker in cold water and place on top of pot. Pour half the mixture on to the Spaetzle Maker. Using the plastic scraper spread the mixture back and forth through the holes into the simmering water. If mixture is very easy to spread, it is the right consistency. If the mixture is too thin, you will end up with thin spaetzle. Repeat process until mixture is used up. Spaetzle can either be served as is, or fry diced onions in butter, add pine nuts and then stir in Spinach Spaetzle. Sprinkle with a little grated cheese and serve.